Pork and bacon meatballs in tomato sauce. 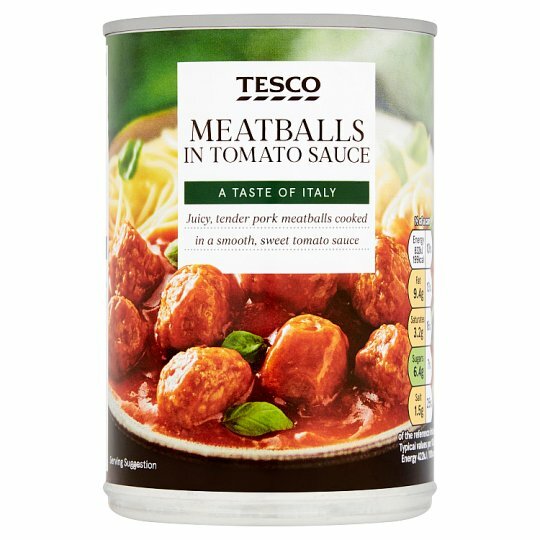 INGREDIENTS: Water, Pork And Bacon Meatballs (32%) (Pork, Bacon [Pork, Water, Salt, Sugar, Dextrose, Preservatives (Sodium Nitrite, Sodium Nitrate, Potassium Nitrate)], Wheat Flour (Wheat Flour, Calcium Carbonate, Iron, Niacin, Thiamin), Water, Rapeseed Oil, Salt, Potato Starch, Sugar, Stabiliser (Tetrasodium Diphosphate), Spice And Herb Extracts [Black Pepper Extract, Chilli Extract, Coriander Extract, Ginger Extract, Nutmeg Extract]), Tomato Purée (23%), Sugar, Modified Maize Starch, Onion Powder, Citric Acid, Turmeric Powder, Salt, Yeast Extract, Paprika Extract, Flavouring, White Pepper, Black Pepper. Store in a cool dry place., Once opened transfer unused contents into a non-metallic container, cover and refrigerate. Consume within 2 days. Empty contents into suitable non metallic bowl and cover. Heat on full power 2 minutes (800W)/ 1minute 30 seconds (900W), stir then heat on full power for another 1 minute (800W/900W). Heat gently, for 4-5 minutes, stirring occasionally.